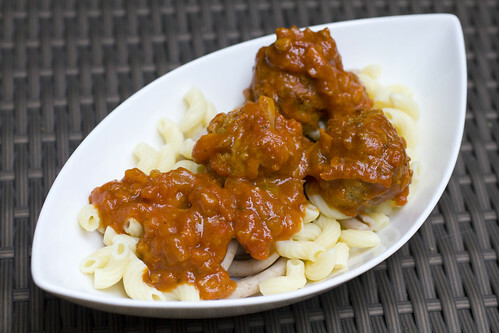 Very tender Duck Fat Turkey Meatballs with macaroni. 1. Heat oil in a large pot at medium high heat. 2. Add onions and saute for 2 minutes, stirring occasionally. 3. Add carrots and celery and saute until soft, about 3 minutes. 4. Add diced tomatoes and crushed tomatoes and bring to a boil. 5. Add garlic and bay leaves. 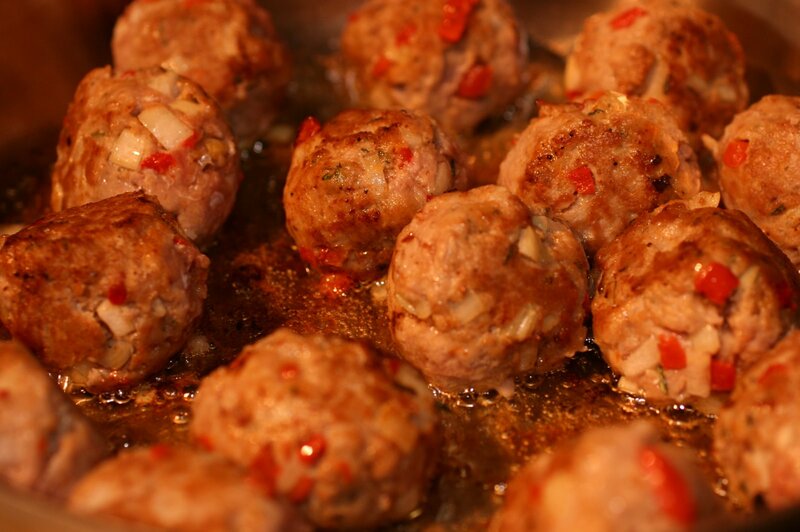 Cover and let it simmer for 1 hour before you pan fry the meatballs. 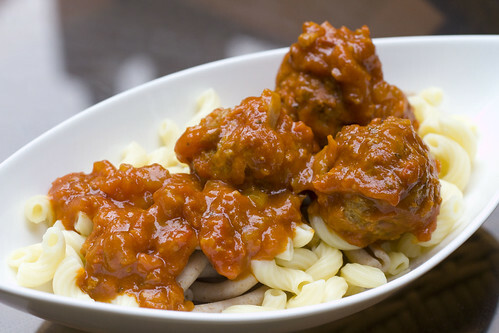 You should prepare the meatballs and cook your pasta during this time. 6. In a large bowl, combine ground turkey, egg, onion, roasted red peppers, bread crumbs, herbs, salt and pepper. Mix until even. Form into 1 to 1.5 inch balls, depending on preference. 7. Heat duck fat in a shallow but large pan. Brown the meatballs lightly on all sides and throw them directly into the pot of sauce. 8. Simmer sauce with meatballs for 25 more minutes before serving. Remove bay leaves. 9. Serve with pasta of choice. Remember to enjoy the wonderful aroma while you cook! posted by jessica	at 07:56 PM	Filed under Italian, Recipes. You can follow any responses to this entry through the RSS 2.0 feed. Both comments and pings are currently closed. Since my husband hates carrots, I stopped putting the effort into chopping the carrots and celery so tiny for my red sauces; I cut into big chunks and use an immersion blender afterwards. I lose the texture, but I snuck in the veggies and all the flavor it adds. I make a similar recipe, but use bacon bits and leftover bacon grease. I’ll try the duck fat next time! Ellen, your husband’s eyes will thank you! I’ll try your method next time I have some picky kids around. Thanks. Using duck fat is a great idea! I’m always searching for ways to make turkey (how shall I put this?) moist and palatable. That looks delicious. I will always love spaghetti & meatballs. Dr. Food, I don’t enjoy turkey breast but I find that dark meat and ground turkey can be wonderful. Asianmommy, spaghetti and meatballs have a special place in my heart as well. Looks yummy, but was wondering if you have any veggie recipes for us plant eaters? Sheryl, here’s one of my vegetarian recipes, Baked Tofu, but I’ll try to work on some more when I get back from honeymoon.